R.J. Rushdoony: 01:59 In Exodus chapters 25-31 and again in chapters 35-39. We have the law given and the directions concerning the building of the tabernacle. Now tabernacle literally means tent. It was the tent of meeting, the sanctuary. These are various terms given to it. It is emphasized as of central importance in the law. We have indeed a great many chapters given to it. A dozen or so chapters. It is important in biblical law for reasons that we tend to neglect. Nowadays generally either we are subjected to fanciful interpretations of the significance of the tabernacle, or it is entirely passed over. R.J. Rushdoony: 03:15 Now as we analyze the meaning of the tabernacle we must see first of all that the pattern of the tabernacle was given by God. In other words a blueprint, the direction, the materials to be used were all prescribed by God. What we read in these many chapters in Exodus given over to the construction of the tabernacle are precisely the blueprints which specify the design and the materials. It is given by God. It is entirely his work. Man contributes nothing to it except the materials and the labor, which he provides. Second we can not understand the significance of the tabernacle unless we see that it is the palace of the King. The palace of the King. The King is God. King of Israel. R.J. Rushdoony: 04:41 The tabernacle, because it was a large and a very ornate tent, required a considerable amount of work for the assembly and the disassembly and the carrying thereof. At that time, because they were in the wilderness journey, God went among them even as they did in a tent. His tent was the royal tent. When they were finally settled King David desired to build God a permanent palace. Temple literally means house of God or palace of God. God, while giving the pattern and the materials to David specified that it was his son, a man of peace, who was to erect it. We are repeatedly told in the New Testament that this was to be by pattern. The house of God was of God’s design. It was his palace. R.J. Rushdoony: 06:04 Now the fact that the tabernacle was the palace of God is not a new fact, although unfortunately it is a relatively unknown one in our day. Not too many years ago this was still the standard statement as we read for example in Vos’ biblical theology. If you go back for the last century [inaudible 00:06:33] Baron at great length deals with the tabernacle as God’s palace and the temple then later as the permanent palace of God. In the past generation or two we have had the ecclesiastical approach applied to the Bible. That is the churchly approach. Reducing religion to the church. The reduction of religion to the church is a modern heresy, because religion as the Bible declares it speaks concerning every area of life concerning church, state, school, work, agriculture, war, peace, the home and family. Everything. It is total. The reduction of religion to worship and the church is therefore a modern heresy. The tabernacle was the palace of God the King, from whence he ruled the nation absolutely. Israel was to present itself at the palace, not only to worship but to be commanded. R.J. Rushdoony: 08:11 This leads us therefore to a third point. The first the pattern of the palace is given entirely by God. Second the tabernacle is the palace of the King. Third, hence there was only one sanctuary. One God. One throne. One realm. One law. There was only one tabernacle in Israel because there was one God. Hence it was that it was strictly forbidden for them to establish any other sanctuary. To do so was to have other gods. It was polytheism. Now the fact that the tabernacle was not the place of worship primarily is obvious from the fact that only thrice yearly was attendance required. Then only the males of Israel. The heads of households. Now obviously it was not primarily a place of worship, because this would be to limit worship to three times a year and for the men only who are the heads of households. The three feasts for which they were to go up are called holy convocations. The word holy does not limit itself to worship. In fact the primary reference of the word holy is to God. Holiness refers therefore primarily to God in all his ways and in all his dealings. R.J. Rushdoony: 10:25 The secondary meaning of holy is all things done in the Lord’s name and to his glory and according to his word. Holiness therefore is not equivalent to worship. A home, a family, that is fully dedicated to God is holy in all its operations. All its operations are not worship. Worship therefore was not the primary function of the tabernacle. The place of worship in the Old Testament was in the home. The father functioned as the priest. It was his jurisdiction to lead the family week by week in worship on the Sabbath. 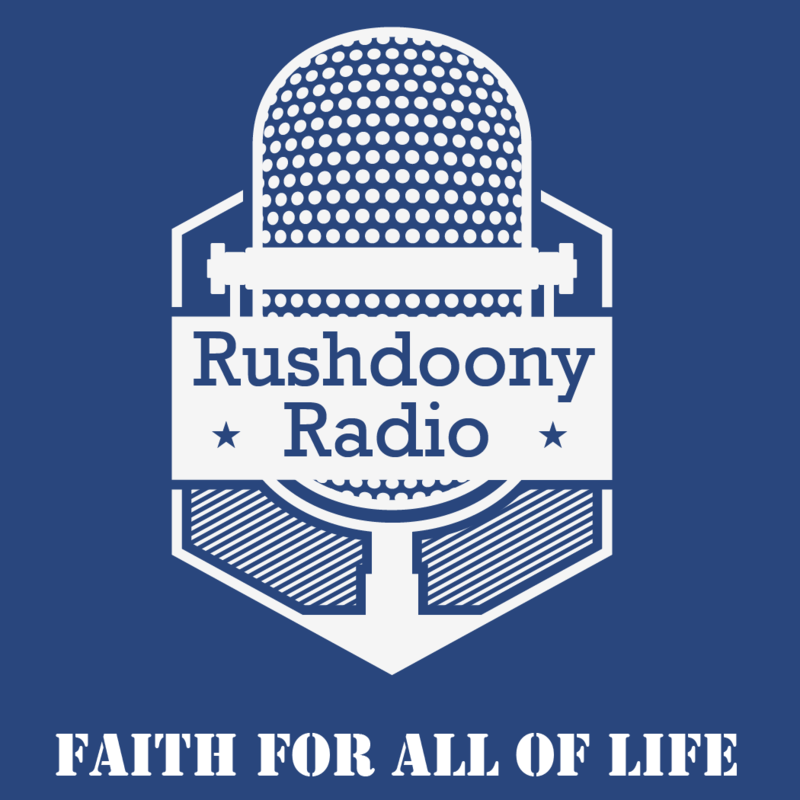 R.J. Rushdoony: 11:42 This may comes as a surprise to you but this was not too remote a thing to America in that there are many people still living for whom this was the routine pattern. For example throughout the west in ranching country, in most of Texas, churches were many, many miles away. Until the advent of the automobile people did not get to church. It was something that was rarely done, but they still had regular weekly worship in the home conducted by the father. This was routine and normal, so it was in the Old Testament. Worship was local. It was essentially and basically in the home. There was only one tabernacle and it was the palace of the King. It was not the worship center. R.J. Rushdoony: 13:08 Well this means therefore that the tabernacle or the temple had, or have, no counterpart in the church. We can not see the church as a continuation of the temple or the tabernacle. There’s no comparison between the two. With the death of Christ the work of the tabernacle or temple, an earthly palace of God, was ended. The veil of the temple was rent in twain. The new temple was Jesus Christ who declared himself to be the true temple of God. He ascended into Heaven and Hebrews declares that there is the true sanctuary and the true throne. The earthly sanctuary was the temple or palace of God among his people. His covenant people. Now that palace is in Heaven. The throne is there. It is true that believers are spoken of as temples of the Holy Ghost. The church is spoken of, that is all believers everywhere, as a spiritual body as the temple or house of God. This is in a secondary sense. R.J. Rushdoony: 14:57 Hebrews makes it clear the true temple, the true sanctuary, is now in Heaven. Hence it is that Jesus Christ commanded his disciples, declaring all power, all authority, all kingship in other words, “In Heaven and in earth is now mine. Given unto me. Go ye therefore unto all nations and make disciples of them.” The command was therefore given for imperialism. Christ as King commands his disciples to go out and command the earth. To bring it under Godly law and order. To go forth and convert men and nations to the true King, Jesus Christ. The throne is in Heaven and all the world is summoned into the kingdom by the great commission. R.J. Rushdoony: 16:27 Fifth and finally as we analyze the tabernacle we understand the significance of God’s throne. The throne is the ark. Extensive directions are given for the construction of the ark of wood overlaid with gold. The ark is an unusual throne. It is not primarily a chair. Now throne is a chair. The ark is primarily a chest, a repository, and a repository of what? The two tables of the law. The ark sat in the holy of holies. The inner chamber of the tabernacle and the temple. A most holy place. The throne room of God. The ark as the repository of the law set forth the fact that the throne of God is his law. This then is a most significant fact. God did not make the altar his throne. The altar was in the outer chamber. The altar set forth the fact that atonement, a salvation, through the blood of the lamb. The altar standing in the middle and behind it the door was as it were the door to God. It was not his throne. R.J. Rushdoony: 18:43 It was that Jesus the King declared, “I am the door. By my act of atonement, I am the door, even as I am the priest and the sacrifice and also the King.” The entrance to the throne room was only past the door. The altar. Thus however basic atonement is, it is not the heart of God’s rule. It is not his throne. The altar is the door to his kingdom. The law is the heart of it. Therefore Hebrews declares concerning Christ that the cry of his being was as he came into this world, “Lo I come to do thy will, oh God.” He himself was the law keeper in perfection. Having ascended into Heaven reigns from the throne of law. Hence it is that the tabernacle and its construction are so important to a study of the law. R.J. Rushdoony: 20:17 Hence it is that so much of modern evangelicalism is guilty of serious heresy in that it speaks at great length on the typology of the tabernacle and of the ark and never mentions that it is a palace and that the ark is a throne and that the throne of God is his law. This has not changed. God’s throne is here set forth symbolically. Christ from Heaven rules in his throne today as always, for he is the same yesterday, today, and forever, is his law. Hence it is that the study of the law is of such great importance. The tabernacle thus has central significance to biblical law for it declares to us that the throne of law governs the world. Let us pray. R.J. Rushdoony: 21:46 Our Lord and our God we thank thee for thy word. We thank thee that the world is under thy law. That thy kingdom is of law. That the men and nations of our day who despise thy law and seek to make it null and void shall feel the judgment of thy law. Our Lord and our God in terms of thy word we stand and wait for thy judgment. Prepare us oh Lord to rebuild in terms of thy law. Make us strong in the day of adversity that we may be more than conquerors through him that loved us, even Jesus Christ our Lord. In his name we pray. Amen.